Halloween is becoming a bigger holiday every year—Americans are expected to spend $8.4 billion on spooky loot this year alone. And though you’ll find haunted houses, parties, parades, and costume contests almost everywhere, some places go the extra mile to celebrate Halloween in extraordinary fashion. These huge celebrations are a great excuse for an autumn road trip or vacation. The city of Louisville hosts an illuminated nighttime fantasy land featuring thousands of jack-o'-lanterns. 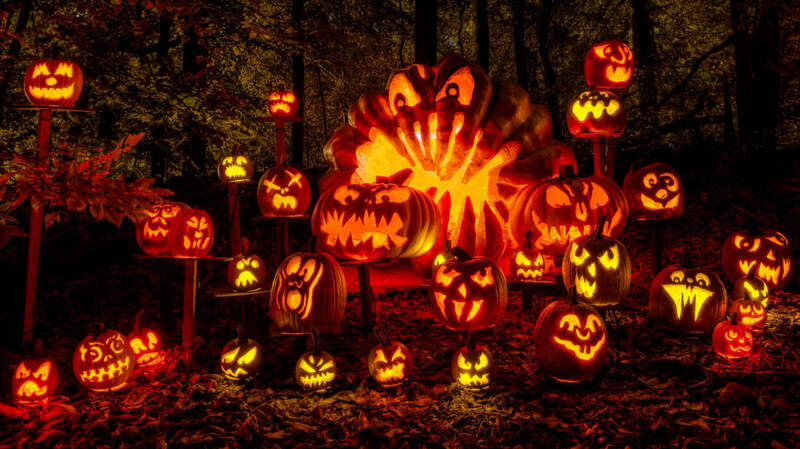 The Louisville Jack-O-Lantern Spectacular is open every night through November 6, where you can enjoy a quarter-mile walking trail in Iroquois Park with 5000 pumpkins—some carved with elaborate scenes from movies or faces of celebrities, others with classic jack-o'-lantern grins—arranged in artful tableaus. What better place to celebrate Halloween than in the town Washington Irving made famous with his tale of the Headless Horseman? Sleepy Hollow celebrates the legend for tourists all year, and makes Halloween a month-long celebration. Take a tour of the Sleepy Hollow Cemetery. Try the haunted house known as the Horseman's Hollow Tour, or see a performances of Irving’s Legend on October weekends. Take the Haunted Hayride through town on October 28 and 29. And there are several spooky historical events to attend in nearby Tarrytown. 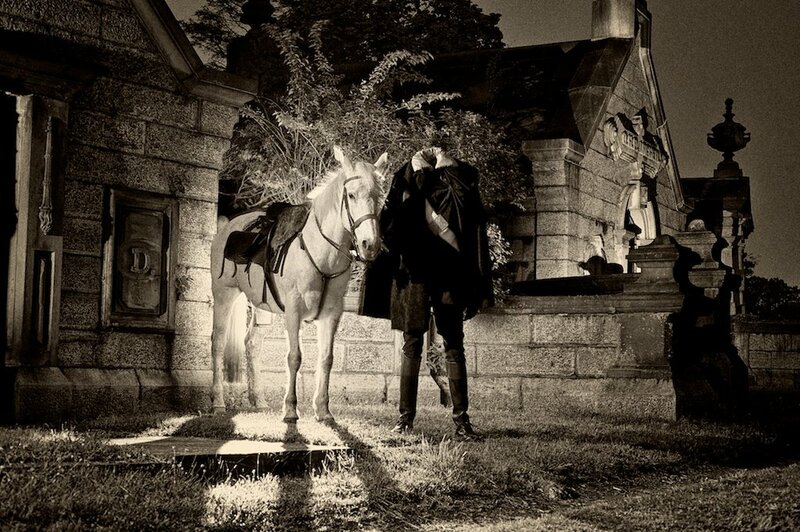 Find out more about the events of Halloween in Sleepy Hollow here. Manitou Springs, Colorado, is famous for their healing hot springs, but for 20 years now, the town has staged a festival revolving around Emma Crawford, who came to the springs to treat her tuberculosis in 1889. Crawford died two years later and was buried on top of the mountain. Legend has it that her coffin was unearthed by torrential rains and washed down the mountain in 1929. Now Crawford is the centerpiece of the town’s annual Emma Crawford Festival. On Friday, October 28, you can attend a wake for Crawford and see her laid out at Miramont Castle, with dinner included. 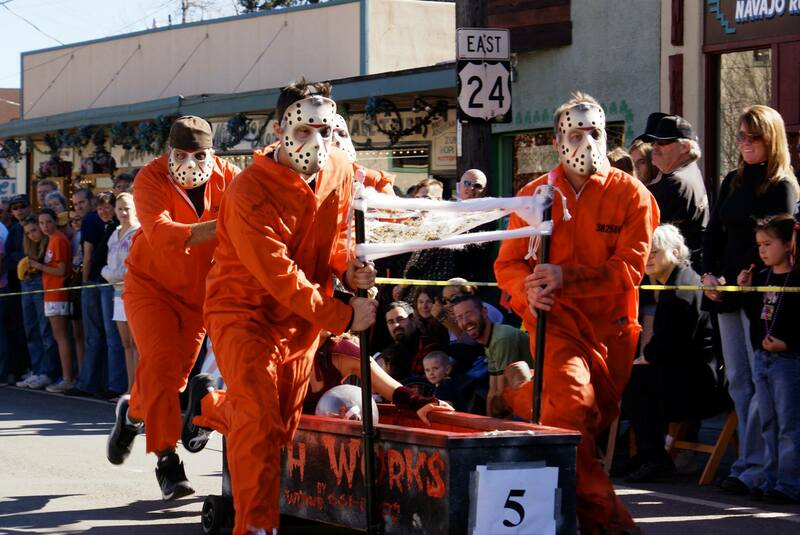 Saturday, October 29 is the day for the annual Emma Crawford Coffin Races and Parade in downtown Manitou Springs. The festival itself ends with ghost tours Saturday evening, but on Halloween night, the town will stage a paranormal investigation ghost hunt. The witches and warlocks of this famed town (and all over) will come together for the annual Salem Witches' Halloween Ball at the Hawthorne Hotel on Friday, October 28. The theme for this year is "Over the Rainbow: The Magical World of Oz." In addition to live music, dancing, and food, you can get a psychic reading during the party, and there's a $1000 cash prize up for grabs in the costume contest. The Witches' Ball is one of the many activities scheduled for the Festival of the Dead in Salem this month. The Louisville Zoo throws a kid-friendly Halloween party every Thursday, Friday, Saturday, and Sunday night in October called "The World’s Largest Halloween Party!" And since the event is aimed at children 11 and under, it's cheery, not eerie. Children trick-or-treat through areas of the zoo dedicated to princesses, superheroes, dinosaurs, pirates, toy land, the sea, and more. Familiar costumed characters are there to greet them with treats, and there are plenty of animals to meet. The event is a fundraiser that helps to support the Louisville Zoo year-round. 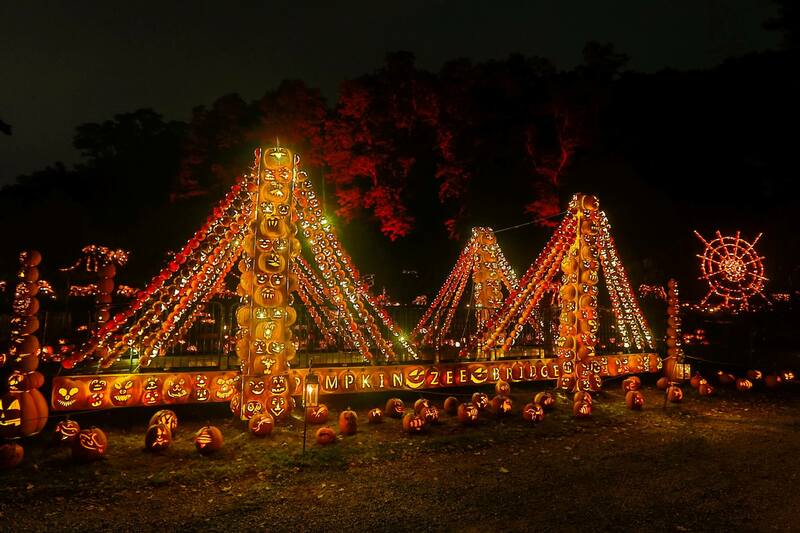 The Great Jack O'Lantern Blaze is a walk-through event held every October in which you can see over 7000 illuminated, hand-carved jack-o'-lanterns lining the town's Pumpkin Promenade. Pumpkins are carved, stacked, and transformed into elaborate sculptures and dioramas, each more breathtaking than the previous one. The Blaze is operating every night through Halloween, and on weekends in November. Consult the calendar and plan ahead—tickets sell out quickly. Half a million people are expected to attend the West Hollywood Halloween Carnaval on October 31, which the organizers describe as expected to be "a bit on the naughty side." The street party on Santa Monica Boulevard—which is alcohol-free—will last from 6 p.m. to 11 p.m., but will then continue into participating bars and venues. Music, both live and recorded, will be provided on several stages. Wear your best costume; other revelers will be going all out. 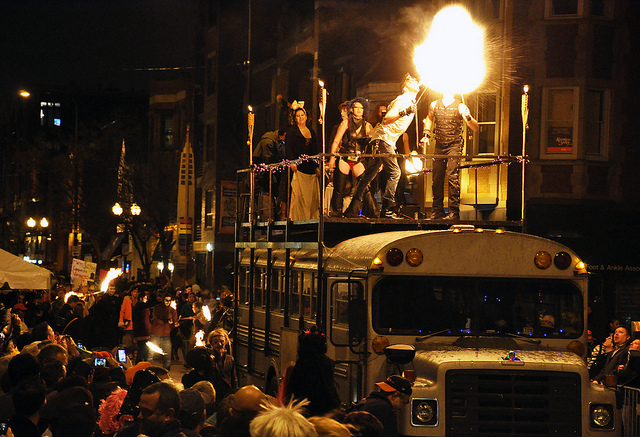 The 20th annual Northalsted Halloween Parade will march through Chicago on October 31. The parade—whose theme this year is the fantastic "Scream, Queen! "—begins at 7:30 p.m. at the corner of Halsted and Belmont, and for three hours, thousands of floats, performers, and costumed participants will be on hand to march through Boystown and participate in the costume contest. If you've planned a spectacular costume and want all eyes on your look, New York’s 43rd annual Village Halloween Parade is the place to party. The parade begins at 7 p.m. on Halloween night, and it shimmies and shakes up Sixth Avenue from Canal Street. Anyone can join in the parade, but you must wear a costume (some 50,000 people participate each year). And if you want to watch the revelry from the sidewalk, you’ll get views of dancers, puppets, and 53 different bands. Better get there early to stake out a spot to see it all.